Voter ID laws: could they help Democrats by motivating disinterested voters? 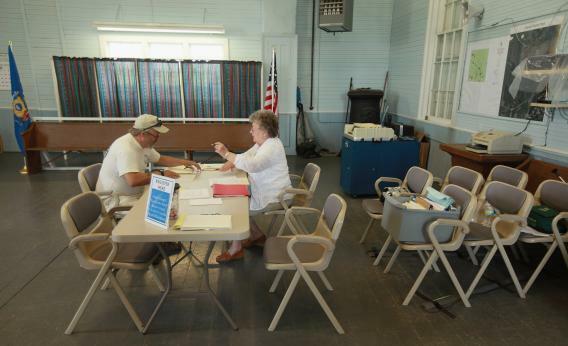 Election Official Myrna Carter registers a voter for the Wisconsin recall election at the Bradford Town Hall in Bradford Township, Wisconsin. Does telling citizens their right to vote is under attack make them more likley to exercise it? A few weeks ago, I wrote about the work being done by Pennsylvania Democrats to identify Obama supporters likely to face problems voting under the state’s new ID laws and the GOTV-style program launched by party operatives to secure documents for them. At the same time, some Democratic strategists have proposed that while new laws may demobilize some of the party’s base by introducing hurdles (or simply confusion) around the voting process, there was potential upside. A they’re trying to disenfranchise you message, especially targeted at young voters and minorities, could motivate unreliable voters to cast a ballot this fall. This spring, a group called the League of Young Voters put this theory to the test by running a randomized-control experiment in Wisconsin before the gubernatorial recall in June, and I joined their canvassers on the streets of Milwaukee. The results of the League’s test are now back, shocking a lot of tacticians on the left who had been plotting to use these voter-ID themes in their messaging. It has opened up a broad debate about the psychology of voting: does telling citizens their right to vote is under attack make them more likley to exercise it? I write about that debate, and the research that triggered it, here.